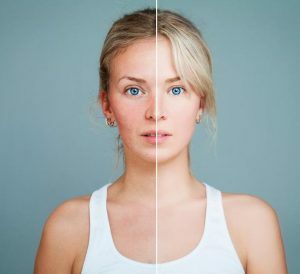 When you’re fit and healthy and want to look as young as you feel, laser resurfacing your skin could be just the treatment for which you’ve been seeking. With a simple 30-minute procedure, those obvious signs of aging can be removed from your face, leaving you with a healthy glow and smoother looking skin. Dr. Cecil Yeung regularly recommends laser skin resurfacing for ladies who want to look and feel great and it’s available right here in Houston at the state-of-the-art Yeung Institute. Let’s take a closer look at what this treatment involves and how it can have you looking younger than ever. There are many visible signs of aging that can appear on your face, no matter how young you might feel. Dark spots and sun damage, fine lines and wrinkles, crows feet, and even acne scars can all be removed to leave your skin blemish-free with laser skin resurfacing. Those blemishes, fine lines, and wrinkles will reduce in appearance and even disappear as smoother, healthier skin replaces your top layers of skin vaporized by the CO2 laser. The state-of-the-art laser used by Dr. Yeung uses the latest high-energy broadband lightwave (BBL) technology to treat just the top layers of your skin, the epidermis, leaving the deeper dermal layers untouched and unharmed. Considering the remarkable effects this treatment can create in making your facial skin look smoother, younger, and blemish-free, it’s relatively quick with a session lasting as little as 30 minutes. During the session, Dr. Yeung administers a local anesthetic along with some topical cooling treatments to minimize any discomfort, although you may feel tightness as the laser uses sharp, warm pulses to vaporize the top layers of your skin. It’s not unusual to feel like you have a mild sunburn for a few days following laser skin resurfacing treatment, with some redness and itchiness. You’ll need to keep out of the sun to protect your skin as it heals and recovers. Dr. Yeung will advise on aftercare to minimize discomfort and aid the healing process. You’ll notice an improvement to your skin, with the texture and tone being smoother and fine lines and wrinkles reduced over time. Also, those dark spots and blemishes eventually disappear over the course of a few months. You’ll find that the results can last for years following laser skin resurfacing treatment, although you may need follow-up treatments as aging continues to have an effect on your skin. Dr. Yeung uses CO2 laser skin resurfacing to treat facial skin because it’s not just effective at removing those damaged top layers, but can also trigger your body’s natural renewal of collagen, too. Collagen is a protein used as a building block in creating stronger and more elastic skin that’s less prone to fine lines or wrinkles. As Dr. Yeung can precisely target the areas of skin that needs treatment with the laser, there’s less downtime and discomfort than other treatments that treat the whole face. Suitable and safe for any skin type, your skin’s overall complexion, and tone is improved with CO2 laser treatment, meaning you can have that healthy glow and younger looking skin for which you’ve hoped. To discover more about laser skin resurfacing with Dr. Yeung here in Houston at the Yeung Institute, book your consultation today by contacting us or requesting your appointment online.